Ian reports a day with a difference yesterday at Grosmont, on a grey cool morning, with Bill Dobson, Steve Hyman, Nigel Bill, and Ian attending for this extra Q6 working party. No usual cups of tea but straight to see Mark O' Brien with his job list. We were all very busy with various tasks - lagging and fitting the dome; disconnecting the ejector steam pipe and resealing; fitting a new copper washer to the chamber side of the drain valve; tightening up the regulator (although that may need some more adjustment); fitting both cylinder cosmetic covers; and tightening up the drawbar nut with the big ratchet spanner, with our team on the rope pulling up the nut and then fitting the locking disc and cotter and split pin. The ratchet spanner is now on the back of the tender. One job that took all day, which looked to be a very simple job at first sight, was the fitting of the sealing ring around the anti vacuum valve. This was started by cleaning up the 3/8"studs and finding the right size packing. Then, when the ring was put in place, it would not line up with the holes in the smoke box. So it was taken away to have the holes drilled slightly larger, but it still would not fit and needed about a 1/16" of an inch removing from the inner circumference. This was done by the shed fitter with an angle grinder, then returned back to the engine and finally fitted. But that was not the end, as all the bolts fitted, bar one on the left side which would not tighten. A slightly longer bolt was then obtained and fitted through the smoke box. However, daylight could still be seen between the sealing ring and the anti vacuum valve into the smoke box. This will mean removal of the sealing ring and more packing being put in. The boilersmiths are aware of the problem and will be sorting it out today. It was also noted that the tender water valves were leaking quite badly, so another job on the carrot valves. It was intended to put a warming fire in and have the loco in steam today, but this has had to be abandoned as there is still some other work to finish off. Subject to that being completed successfully, the plan is then to start running in with some trips up the bank to Goathland as with the J27, then, if all is well, the next day trips to Pickering on the back of a service train, and then possibly taking a train on its own. The intention is to get 200 miles of successful running in completed, in the light of which a decision will be made about whether it goes to the Severn Valley or not for its Gala over the 22/23 September weekend. If not, the NYMR has a Plan B agreed with the Severn Valley, but, regardless, the Q6 and the J27 should both be running at the NYMR Gala the following weekend, 28/29/30 September. Ian Pearson reports that the Q6 had a successful steam test today with the boiler inspector present to observe. The vacuum ejector has also been refitted. Looks like there may be some running in next week, but the working party on Wednesday will still go ahead in case there are any last minute jobs, and to do a tidy up in Deviation Shed. There will also be a cake to, hopefully, celebrate the Q6 's return to operation at long last. With the J27 also likely to be back in traffic by the end of next week following its 28 day wash out, and the K1 working in Scotland, we could have three locomotives at work next week - or is that tempting fate?! In my absence in mid Wales, Ian reports a cooler grey day at Grosmont today with Jon Bradley, Derek Shorten, Steve Hyman, Nigel Bill, Nigel Hall and Ian himself. After the usual cuppa and chit chat, Ian, Jon, Nigel B, and Steve went to assist MPD fitter Andrew Jeffery and two other shed staff to weigh the locomotive and also dismantle the weighing gear later on. The tender had been weighed yesterday (Tuesday). Derek washed up all the dirty pots and then set about sweeping out the workshop and Deviation Shed walkways. Nigel H arrived with his van laden with scrap and rubbish from Hopetown and this material was put in the skips at the MPD with permission from the Railway. Following completion of the fitting and expanding of the elements over the previous few days, Mark O'Brien and his men hydraulic tested the header and the elements to 100 psi. All was OK with no leaks. Steve took the gauge glass protectors off for cleaning and found that one of the back plates was in poor condition, as the black and white markings were virtually non existent. This was swapped for another one which was found upstairs in Deviation Shed, and the one in poor condition has been sent back to Hopetown for re-painting via Nigel H. The cleaned and repaired gauge protectors were refitted back on the engine, now looking very smart. The vacuum ejector is in the process of being re-built by Keith Pardey, although there are still a few components to install. Tomorrow, Thursday, will see the start of the valve setting by Sean Bowler and Andrew Jeffery of the MPD staff. The broken pilot valve from the regulator has been replaced and machined up, along with the faces on the regulator. This will be fitted shortly. We measured up the recess on the smokebox for a new graphite door seal which Mark will order. The main steam pipes will be fitted tomorrow, following the sealing rings that sit inside being ground in by Mark O'Brien this afternoon. So what's left to fit are the chimney, smoke box door, spark arrester and concrete arch. We may have it in steam by the end of next week -fimgrers crossed! Lunch today was in Deviation shed with quite a few visitors. Roy Marshall and Les Harper assisted the MPD fitters at New Bridge, Pickering to couple up the J27 which is ready to travel back to Grosmont tomorrow. Just three of us - Ian Pearson, Steve Hyman and myself - gathered at Grosmont yesterday on a grey morning. After the usual cups of tea, and a chat with Barney Casey of the MPD about the jobs to be done, the three of us set to on the vacuum ejector down in the machine shop. The day was spent sorting out the various parts of the jigsaw puzzle that needs to be put back together with the aid of the railway equivalent of the garage mechanics manual, locating a replacement for the apparently missing clack, and lapping in the various valves. This took us all day, albeit a shorter one than normal, and, as requested by Barney, we left all the parts ready for Keith Pardy to put the ejector back together on Monday when he returns from his weeks holiday. Elsewhere, the Q6 has now been moved back into the running shed, along with the elements. The top row of elements have now been installed (see photo), with a one eigth of an inch projection into the header, and Chris Kelly was working on their expansion (see photo) using the tube expanders from the upstairs store in Deviation Shed. Progress is slow, but Mark O'Brien is reportedly going to spend the weekend working on the elements, so hopefully completion of their installation and hydraulic testing of the header will be completed very soon. Earlier in the week, examination of the regulator pilot valve, preparatory to cleaning, found that it was cracked and then it broke in two (see photo). It was despatched to Lanes for a new one to be cast, which was done yesterday, and it is due to be returned to Grosmont today for machining ready for fitting. The other part of the regulator mechanism into which it slots was also being machined yesterday. A bright warm, but muggy, morning at Grosmont yesterday with Bill Dobson, Ian Pearson, Jon Bradley, Steve Hyman, Dave Donegan, Nigel Hall, Roy Marshall and myself. The usual cups of tea for starters, some having biscuits as well from the replacement biscuit tin following the sacrifice of the original one to tannin for the J27 on the Wensleydale! The header had been fitted and successfully hydrauliced on Tuesday, so the elements were annealed by Ian and Jon (see photo) and polished with emery paper while all the header holes were cleaned with the drill and flapper wheel. The snifting valve was fitted and also the valve that supplies steam to the vacuum ejector from the manifold. Last week it was intended to replace this valve, but Steve Hyman investigated the source of a new one, and found out that these valves are OK for both steam and water. So our old valve only required a new washer, which Steve made from material from James Walker called Chieftain X which met our specification, and the valve was fitted back on the Q6. Lunch was had alfresco on the picnic benches outside Deviation Shed. After lunch, the top row of elements were placed into the flue tubes. Bill had to go up to Egton Show to do a presentation with the Goathland hunt, but left instructions to remove the blank from where the regulator fits the main steam pipe and fit the regulator. Having removed the blank we were told by Barney Casey that it should not be removed, nor the snifting valve blank which had been removed to fit the snifting valve fitted earlier during the morning. So the regulator blank was refitted and the snifting valve removed and its blank refitted. Then Chris Kelly and Barney struggled to get the elements to fit under the header and move them into their respective location. There was talk that they were too long but, after using a variety of bars and packing to no avail, the cavalry were brought up from the MPD, and with the involvement of more of the shed staff, eventually, by 4pm, two of the elements were successfully fitted into the header (see photos). Hopefully, all the remaining elements will be fitted in the next few days, a further hydraulic carried out, followed by another in house steam test before one for the boiler inspector. The major remaining job will then be the valve setting. Meanwhile, Steve stripped down the steam heat valve, as a new valve head had been made, but the seat inside looks slightly damaged and may have to be recut. I spent the day down in the MPD workshop, away from all this excitement, working on the vacuum ejector, cleaning the body and grinding in some of the valve heads. Nigel joined me later in the afternoon, and following a conversation with Keith Vardey (who was being filmed by Channel 5 machining the remetalled axle boxes for Sir Nigel Gresley, one of which will have to be remetalled), we decided it would be best for him to rebuild the ejector, as he took it apart originally, and would probably need to do so again to satisfy himself that we had put it back together properly! A warm but rather cloudy morning at Grosmont with a good turnout - Bill Dobson, Ian Pearson, Steve Hyman, Derek Shorten, Dave Donegan, Nigel Hall and myself, along with Tom Noble who was on cleaning duties at the MPD. As usual, cups of tea all round, and a new stock of chocolate digestives to keep us going. Then we found out that the Q6 had failed a steam test for the second time. On Tuesday, with about 40lbs on the clock, 6 small tubes were found to be leaking. These were expanded at 5am on Wednesday morning and the Q6 then lit up again. 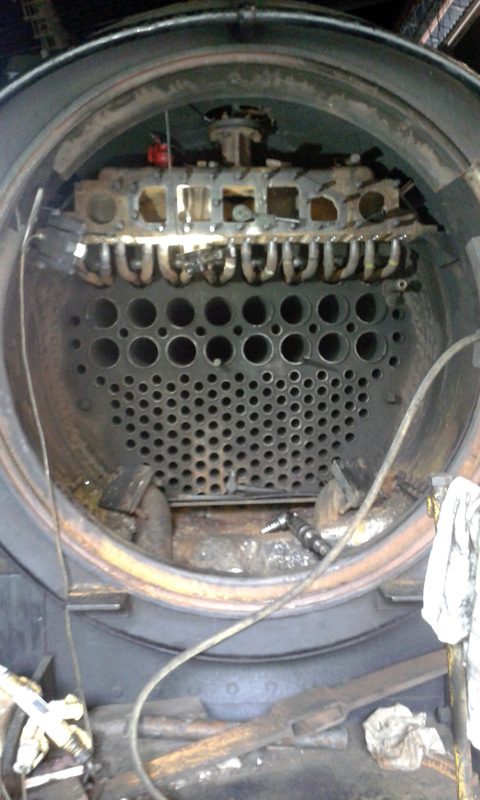 By late morning, it had 100lbs of steam on but when the boilersmith checked the firebox, 3 small tubes on the left hand side of the box were leaking, so the fire was thrown out again and the engine left to cool down. The plan then was for Chris Kelly, the boilersmith, to go in at 5am this morning and expand the leaking tubes and then have another go . At the time of writing I have not heard whether that was successful. 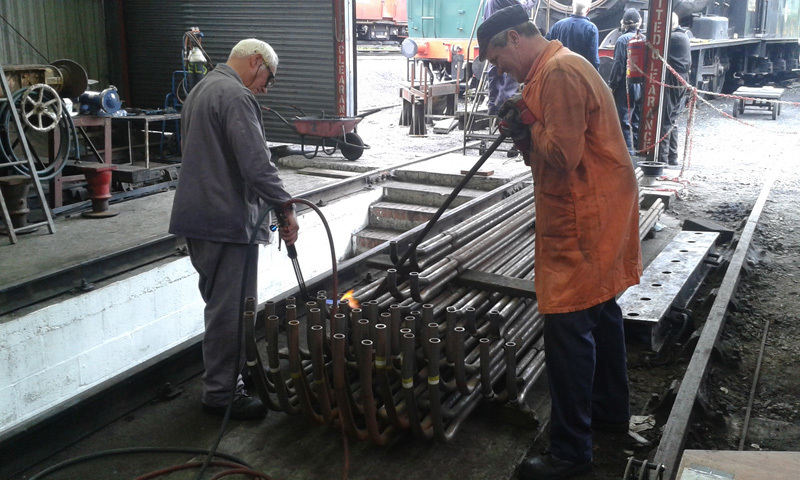 As a result, Derek and Nigel set about cleaning and painting the valve covers, while the rest of us worked on the ejector which had been left in the machine shop several months ago, on the understanding that the shed fitters would refurbish it. But now we are undertaking this job. So yesterday the body of the ejector was gritblasted and NDT'd by myself, as well as some of the other small components. Dave stripped the chamber side drain part of the ejector, gritblasted it cleaned it out and reassembled it, and then I did an NDT on it. All NDT inspection was OK and photos taken for the MPD records. In the cab, the valve that supplies steam to the ejector from the manifold has now been removed as it is a water valve, and a blank has been fitted for the time being. The old valve has been taken away by Steve Hyman in order to get a new steam valve replacement. Lunch today was in Deviation Shed with quite a lot of visitors around and money going into the repositioned donations box, to make it more obvious . Some more tannin was requested for the J27 at the Wensleydale Railway, and a large bag full has been sent with Nigel, who was going to deliver it today. A request from the Wensleydale Railway to extend the stay of the J27 is being considered. To fit in with a 28 day wash out, and its motive power requirements in early September, the NYMR has agreed that it could stay to operate up to and including Friday 31 August, with it returning to New Bridge on 3/4 September. However, a final decision is dependent on whether the necessary crewing can be arranged, and Richard Pearson is now pursuing that with the Wensleydale Railway. A fine cooler day at Grosmont yesterday with Bill Dobson, Ian Pearson, Nigel Hall, Derek Shorten and myself. Bryan Orange and JV Luke Perry were also present at the end of their Deviation Shed holiday, and were working on the emergency lighting. Usual cups of tea all round then thoughts on what to do! The loco was down at the MPD on No 4 road where there is no pit, and was having the 8 header studs drilled out due to some thread damage and to make a better access to expand the ring into the main steam pipe. The large tube expander required for that job arrived from LNWR Crewe in the morning, and is expected to be carried out today. With the replacement of the studs, an internal hydraulic could be carried tomorrow, and if all is well, the boiler inspector hydraulic early next week. In preparation, a couple of leaking valves in the cab were attended to by Bill and myself - the steam shut off valve to the vacuum ejector and the steam heat valve. The steam shut off valve will need replacing as it is not suitable for steam operation. It appears to be a water valve but has been on the loco for some years! The rest of the team set about sorting out all our taps. 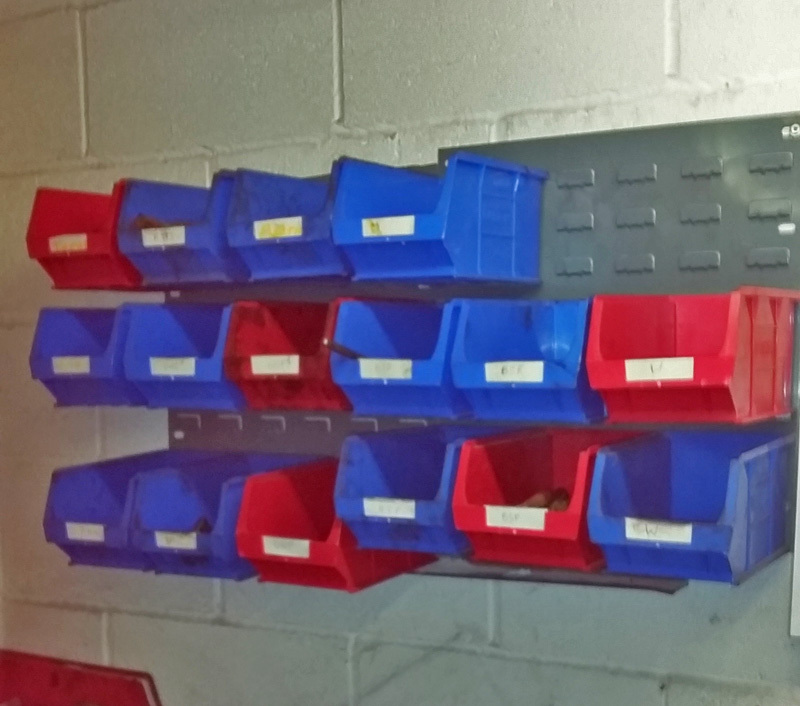 These had been thrown in a box for many years, but now they are all separated into containers which have been attached to the south end workshop wall, with the boxes marked accordingly W (Whitworth), BSF (British Standard Fine) and so on (see photo ). This job took up most of the day but the work bench is looking a lot tidier at that end of the workshop. Ian also asks if anyone can identify a copper ring which was found when clearing the bench (see photo). I also carried out the monthly defibrillator check, much to the interest of our many visitors. Lunch was had in Deviation Shed with Derek brewing the tea and quite a lot of visitors around. At the end of the day the pit pump would not work although it had been operating fine during the morning, clearing water that had been drained from 825's boiler. Bryan checked round the electrics and found a loose wire in the switch panel which he repaired and it is now working OK. Nigel acquired one of our treasured biscuit tins, which was filled with tannin for use in the water treatment for the J27. He delivered it to the Wensleydale Railway last night. The steam crane was in action lifting the boiler off Green Knight No 75029 which attracted much visitor attention, and was extensively filmed by the Channel 5 documentary team. The boiler is now down at the boiler shop waiting for assessment and overhaul. The B1 was carrying a wreath in memory of Dave Fowler, the B1 Trust Secretary, who has died from stomach cancer. 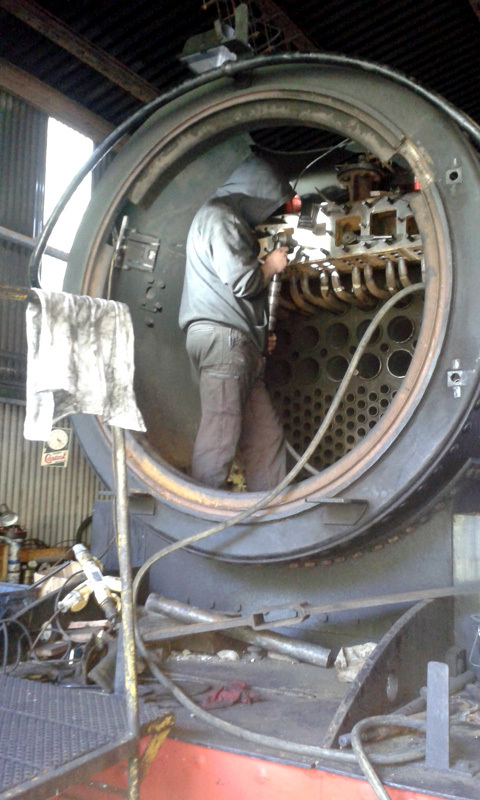 The work on 825's boiler is ongoing, with continuing problems in getting a satisfactory seal between the J pipe and steam pipe. There will be no working party this Saturday. The next working Party will be on Wednesday 15 August, by when a successful hydraulic test could clear the way for the refitting of the header and the installation of the new flues. Last minute news from Leeming Bar. The J27 has suffered a broken engine spring and been stopped this morning. Tim Williamson is going over to Grosmont to collect two spares and the engine will hopefully be back in traffic tomorrow. Apologies for the absence of recent Q6 updates, but Bill reports that it has been a fairly frenetic period with activity on nearly all days. Wednesday 25th started with Paul Jamieson, Roy Marshall, Dave Donegan and Bill Dobson at Deviation Shed. 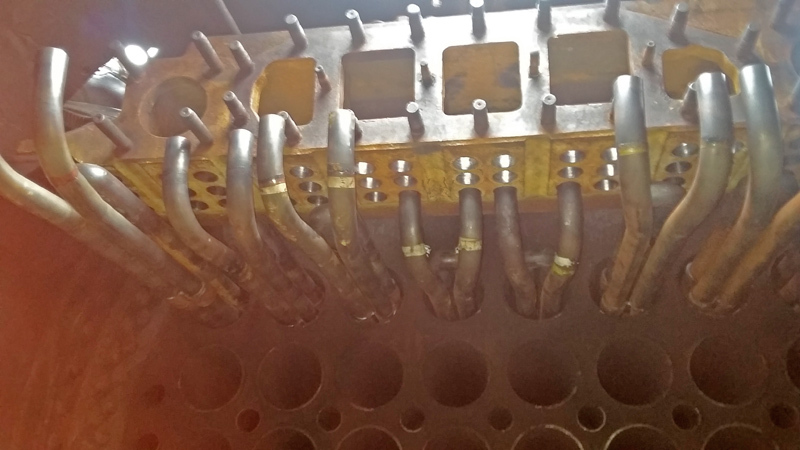 The prime task was to remove the blanks for safety valves and whistle, and then fit them, together with new gaskets. Then the dome cover was removed, and the rubber gasket on the J-pipe blank was replaced by a steam joint. This will enable the boiler to be steamed shortly after hydraulic testing. That evening the boiler was filled with water. The following morning a hydraulic test was done, and a small leak was found on the copper firebox door plate along the line of the weld done in 2014 at Crewe. A dye penetration test was carried out and a hairline crack, about 1 inch long, was revealed. After consultation with the boiler inspector, Mark O'Brien arranged for Derek Brewster, a copper welder, to travel down from Inverness on Friday. A high power welding set and a bottle of helium gas was also organised by Mark on Friday. Mark carried out preparation work, and the weld was done early Saturday morning. On the Sunday some weeping small tubes were expanded, and the boiler refilled. Early Monday morning (30 July), a further hydraulic showed further leaking along the line of the old weld, and Derek returned and carried out further welding, making a total length of about 9 inches. Another hydraulic test was carried out to 270psi with no more leaks in the region of the old welding. However, a small leak was observed where the main copper internal steam pipe comes through the front tubeplate. Once this is eliminated the boiler should be ready for the boiler inspector to witness the formal hydraulic test, which will start the "clock" on the 10 year inspection period. On 1 August, Roy Marshall, Nigel Hall, Bill Dobson and myself were present. Unfortunately Mark O'Brien was not at work that day, so the planned work on the copper internal steam pipe - the removal of the inside steel ring to enable a new tapered one to be machined - could not be carried out. So, apart from a long lunch in the sunshine at the picnic bench overlooking the MPD, and a number of discussions with NYMR management about progressing the Q6 work, the final jobs of the week were to refit the regulator handle, and continue removing concrete from the smokebox, both of which Roy tackled with his customary enthusiasm! Elsewhere, the missing drawbar spanner for the J27 was found and Nigel has taken it to reunite with the J27 this week. 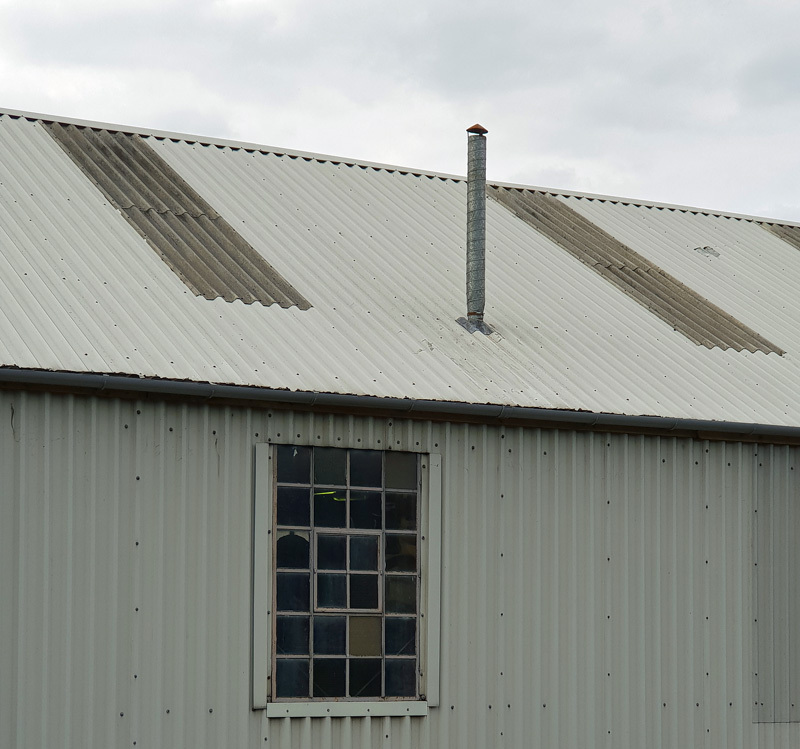 In my absence in Australia, the outstanding work on the stove chimney and its roof access has been completed, and the Grosmont external end of Deviation Shed now proudly shows its name. 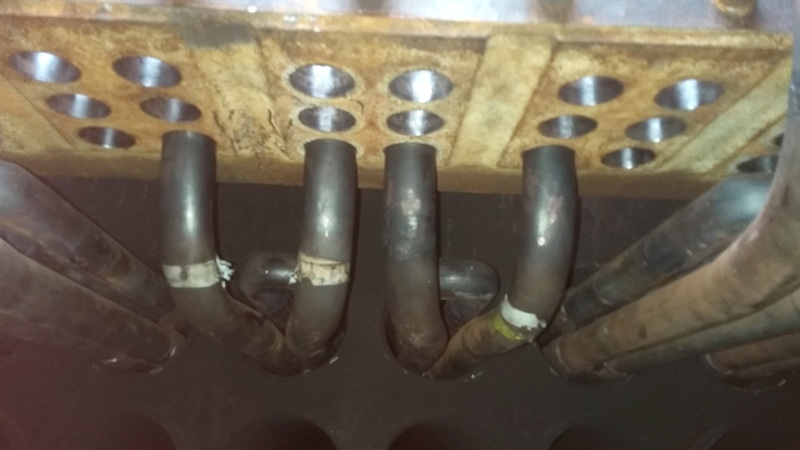 With completion of the stay work, the boiler for the S15 has been filled with water and some weeping stays dealt with, but it is also suffering the same problem as the Q6 with its copper internal steam pipe. Assuming that can be resolved in the same way as that for the Q6, it is hoped to carry out an internal hydraulic test next week. The new cylinder block for No 29 has been delivered from the machine shop on Teesside and trial fitted. Some work is required to build up and match the securing holes in the frames to the new block, but that should be finally fitted in the next week or so. Outside, No 75029 has been brought down from the backfield and the cab was being removed on Wednesday prior to a boiler lift so that a full assessment of the required work can be made. Bill reports that yesterday was excellent weather-wise, but the noise pollution was severe, with needlgunning, beading over and stay head forming going on in all parts of the site. The Hartlepool Mafia was out in force, with Roy Marshall, Dave Donegan and Dave Whitfield in attendance, supplemented by Derek Shorten and Bill himself. Derek spent much of the day doing a much-needed tidy up of the workshop, while Dave Whitfield put together the toolkit required for the J27's trip to the Wensleydale Railway, and loaded it onto the back of the tender. The J27 is currently on washout, and rostered to work a train to Pickering on Monday. Bill is to split the engine /tender on Tuesday at New Bridge, but could do with a volunteer to assist. Please contact him directly if you are able to help. On the Q6 itself, the good news is that the final stages of beading over the tubes are underway, with a boiler hydraulic test planned for tomorrow, and to be witnessed by the Insurance Company boiler inspector on Monday. The final preparation of the header was successful, and it is now ready to fit to the boiler immediately after the hydraulic exam on Monday. 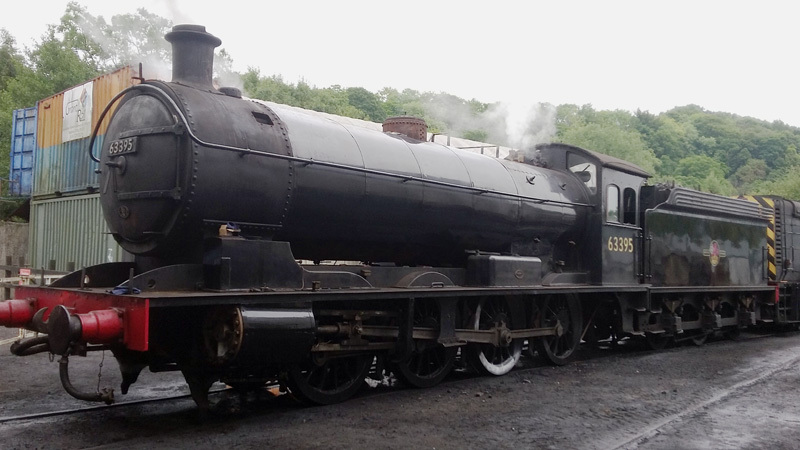 Bill Dobson reports that, as it was known that the NYMR boiler department retubing work was on-going, a "lean and mean" working party was arranged in view of the limited amount of work that could be done on the Q6. Dave Donegan, Roy Marshall and Bill assembled and the plan was to prepare the header for fitting to the boiler and to go over the engine with Barney to check things such as cotters etc., ie a mini FTR exam. However, this plan had to be aborted as Barney was called to Whitby to sort out failures of both steam and diesel engines, the former (Repton) with an AWS fault and the latter with a pressure switch fault. When the header is fitted to the tubeplate we want to hydraulic the header and internal steam pipe in order to be assured that the potentially troublesome joint between the header and tubeplate is sound. This will require a different method of blanking the element holes due to limited access . The header was moved from Deviation Shed down to outside the boiler shop. 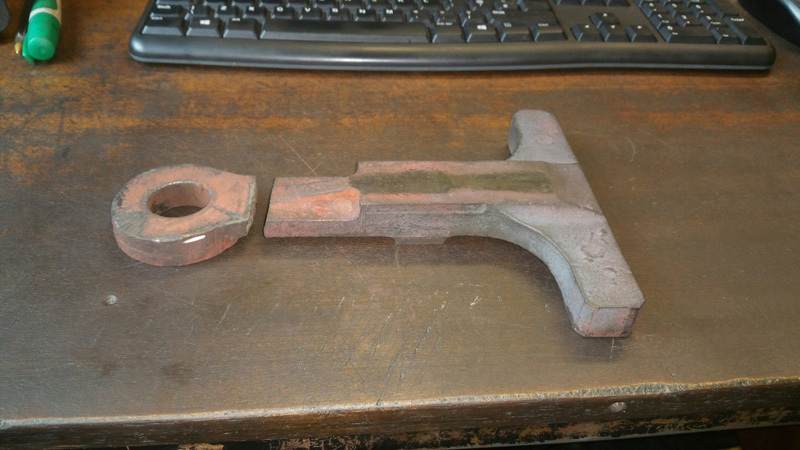 The lens joints for the smokebox steam pipes were grit blasted, and a new joint for the ejector exhaust was made. All the gauges in the cab were connected up. The last flue tube is now fitted and the small tubes are being expanded in the fire box. Once that work is completed, a hydraulic test will be arranged, and then that will release more work to finish off the engine. It seems a long time since the 19th of March and not long to 23 July.